disappointing .8667. Either way, they have to decide which goalie to roll with as CCHA games continue. than a split against most teams to be truly valuable in pairwise. Analysis: The Bulldogs of Ferris State haven't been as dominant as they would like, though they are still in the top 20 of the USCHO.com poll. They're even on the season with a 2-2-2 record, having begun CCHA play last weekend with a split. That said, Ferris State has been improving, beginning the season with a loss and a tie and garnering a complete split last weekend. The Bulldogs will need to keep improving this season. enough in Atlantic Hockey to be a TUC. season. If Maine wants to get rolling, they will need to start clicking to score some goals. Analysis: Minnesota-Duluth has been middling so far this season, starting off 2-3-1. The scoring for the season, however, has been exactly even, with UMD gaining 14 goals to the 14 of its opponents. UMD needs to get scoring consistently as WCHA play continues. Big Red, UMD will need to sweep a few series. and is currently at #2 in the WAY TOO EARLY PWR rankings. Five is the magic number for Denver. #3 by the time Cornell and Denver meet. since then), Air Force, and Michigan Tech (who earned a split with #2 in the country Minnesota). Denver is going to be a team the Big Red could get major PWR points for beating. track as we wish them the best of luck in the rest of their season. During the countdown, we at WAFT have left Good Evening, Hockey Fans to go, due to the sheer volume of posting, but we are starting it up again, now that the season is in full swing. So look to find your weekly Good Evening, Hockey Fans posts on Tuesdays throughout the season. A New Mask, A New Season? 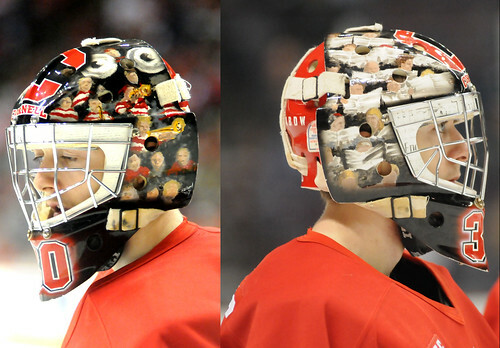 The front and left side of Scrivens's mask, featuring the Lynah Faithful with their newspapers. Inside the mask, there is a newspaper theme as well, with the Ithaca Times being lined out above his eyes. The back of Scrivens's mask has a maple leaf, an homage to his Canadian nationality, as well as other features. Andy Iles's mask is something of note, as a Cornell goaltender's always is. From alumnus Ben Scrivens's mask featuring the Lynah Faithful to Andy's mask last year featuring Ken Dryden as well as some wonderful Cornell features, to Omar Kanji's entertaining mask, the goaltender mask is something of note for fans of Cornell hockey. So when Cornell equipment manager Sean Schmidt tweeted pictures of Andy Iles's new mask, it was something of note. Iles kept the same mask his freshman and sophomore years, so it was unexpected that he would get a new one. His new one, however, holds quite a bit of significance for the Big Red. Instead of the red of last mask, this new one is notably white. The incredibly sharp mask features huggy bear on one side, ivy throughout as well as the Cornell seal. What was most notable, however, was the back. The back of the mask has green and pink ribbons, as Iles's masks often do, but what is most interesting is the inclusion of Cornell's previous national championship years with a simple, sleek '67 on one side and '70 on the other. It appears that Iles's goal for the season might be a bit higher than the norm. As much as we at WAFT enjoyed the last helmet, love this iteration. @cornellwaft I tweeted about it before the game -- junior Chris Hogan has joined the team as a third goaltender. 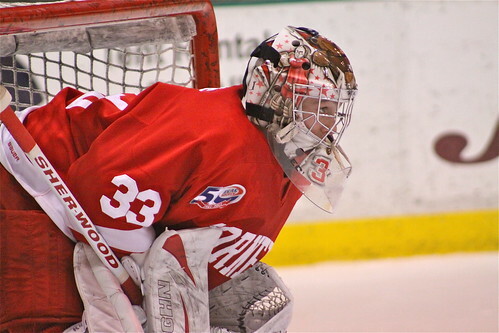 Cornell began its preseason with Andy Iles and Omar Kanji as its only goaltenders. Many of the Lynah Faithful were weary about whether having two goaltenders instead of the normal three (or four in the case of Michigan this season) would be a problem. But at the first game of the season, Cornell dressed three goaltenders, the third of which wore the number 30 without a name on his back. Brandon Thomas confirmed that this was Chris Hogan and that more information would be forthcoming. Hogan played for Cornell's ACHA team as one of their goaltenders in the past. He is an engineering student and we will keep you apprised as we learn more. Cornell comes in with a 97.0% graduation rate which is amongst the highest in the country, in the middle of the Ivy League. Dartmouth tops the Ivies with a 99.7% rate and Penn caps the lowest of the still high rates with a 96.4%. It is important that the Ivies continue to graduate athletes as they graduate students, which is impressive for the amount of varsity sports which Cornell sponsors. Cornell women's hockey has been very busy the past few days. Since Saturday, the Big Red have started their season opening with a two-game series at Boston University before their home opener yesterday against St. Lawrence in what was touted as a rematch of last year's ECAC championship game. We're going to take a look at what the Lady Rouge (and their opponents) have done so far this season and what we have to look forward to this coming weekend. Boston University started their season with a local rival: Boston College. They beat BC 4-2 on the road and continued the season on a tear, winning all of their games before Cornell game to town. Boston University handily defeated RPI and Union at home and Northeastern on the road. It was a different story when the Lady Rouge came to meet the familiar opponent. (The last meeting between the two teams occurred in the NCAA Tournament in a memorable 3OT game.) The Big Red dominated in the first game, skating to a 5-2 victory with all five goals scored by different players. Freshmen Anna Zorn and Taylor Woods scored their first NCAA goals while sophomores Emily Fulton and Monika Leck netted two more and junior Jessica Campbell got the empty netter for a decisive outing from the forwards of the team. Two of the goals were even strength, two were short-handed goals and the remaining was an empty-net goal. Alyssa Gagliardi and Hayleigh Cudmore notched a pair of assists while Jill Saulnier, Brianne Jenner, Lauriane Rougeau, and Lauren Slebodnick (yes, our GOALTENDER) also made their way to the box score with assists. Speaking of Slebodnick, she had a total of 25 saves for a save percentage of 0.926 on the night. For as well as Saturday went, Sunday was not the Big Red's day. They dropped a 5-1 game to the Terriers with the sole goal being scored on the power play by Laura Fortino with assists from Jill Saulnier and Brianne Jenner. The Big Red earned a split on the weekend which was incredibly impressive given that it was the first weekend of games for Cornell when Boston University had 4 NCAA DI games under their belt already. Tuesday brought ECAC foe St. Lawrence to Lynah Rink in a non-conference match between the reigning ECAC Champions and the Big Red. St. Lawrence, much like Boston University, has played 4 games so far this year, but they could not have started more differently than BU. The Saints dropped their first four games, two to Clarkson (currently ranked #4 in the country) and two to the University of Minnesota (currently ranked #1 in the country). And the luck was not with St. Lawrence again for their fifth game of the year. The first period started off slow until a run of 59 seconds that proved to be explosive for the Big Red. In less than a minute, Cornell scored three times with three different players scoring a goal. At 15:01 Emily Fulton scored her second goal of the season unassisted. Thirty seconds later, Brianne Jenner got her first goal of the season assisted by Jess Brown and Emily Fulton. The third goal came 29 seconds after that, from either Alyssa Gagliardi or Anna Zorn, depending on who you believe. (At the time, it was credited to Zorn, and that is what the commentators seem to think happened, but the box score gives the goal to Gagliardi.) The other assist was given to Jill Saulnier. Immediately after the third goal, St. Lawrence swapped out their goaltender (Carmen MacDonald, last year's tournament MVP) for Guilia Mazzocchi who played the remainder of the game. The second period was scoreless for both teams. Scoring picked up again in the third with two goals from the Big Red. The first was scored by Emily Fulton, her second of the night, from Alyssa Gagliardi and Hayleigh Cudmore. The final Big Red goal of the evening went to Anna Zorn, from Brianne Jenner. Overall Cornell scored 4 even-strength goals and one power-play goal. The Saints attempted to rally, scoring one a little less than halfway through the third, but their rally fell short there. Cornell improved to 2-1-0 on the season. Next weekend begins ECAC and Ivy play for the Big Red with Brown and Yale both coming to Lynah Rink for afternoon games. Brown has only played one game this year, losing 4-2 to Princeton. Yale comes to town on Saturday. Yale has started the season with two losses. Both games were against CHA teams. Robert Morris beat the Elis 2-0 and new DI team RIT shut out Yale 3-0. This weekend looks to be a big one for Cornell hockey in general, with the men and women both playing at home. Should all go well, the women should look to start conference play with a great record. Zorn and Gagliardi celebrate after Zorn's first goal of the season in the Big Red's 5-1 win against Boston University. The countdown until the beginning of the 2012-13 season has begun to wind down. Cornell’s first of two exhibition games was played last evening. With six days remaining until the Big Red meets Colorado College for the season-opening regular-season clash, we recognize one of the players who will be most crucial to realization of Cornell’s national ambitions in this coming season. His number may place him last on this countdown and he may patrol behind the blue line often, but Nick D’Agostino will be at the forefront of many of Cornell’s successes this season as he has been throughout his first three years at Cornell. D'Agostino was crucial to Cornell's successes as a freshman especially against Harvard when his solid defensive play helped Cornell and Ben Scrivens earn only the second-ever shutout of the Crimson in Cambridge for Cornell. Ken Dryden claimed the first. Nick D’Agostino arrived on East Hill with his talented class for Cornell’s 2009-10 campaign. His leadership was already evident even when he was among the youngest members of the team. One could foretell reasonably that it would be he who would be a captain at the helm of the Big-Red juggernaut by the time he embarked upon his senior campaign with his classmates. One who guessed such would have been proven correct as D’Agostino will serve as one of Cornell’s three captains in this coming season. D’Agostino’s leadership and assertiveness were never a question for the Lynah Faithful. His first collegiate game was against the Purple Eagles of Niagara. Surprisingly, for a team that would later earn Cornell the appellation of “the dream-crushing, soul-devouring juggernaut,” the Purple Eagles looked poised to dampen the early-season successes of a team that in retrospect seems an all-but-inevitable ECAC Championship team. Niagara tied the game in the waning minutes of the third period. The clock had marked more than three minutes of overtime before a quite serendipitous series of events occurred. D’Agostino had stayed on the ice for a very long shift (a fact that now seems blasé to most of the Faithful, but at the time was very impressive for a freshman). He saw the crucial opening play develop before him and made a crisp pass to then-captain Colin Greening who directed the puck to then-junior Joe Devin. Cornell claimed victory in the opening-game of the 2009-10 season with play from now nearly legendary captain Colin Greening with future captains Joe Devin and Nick D’Agostino. It seems all but preordained in retrospect that D’Agostino would join their ranks as a leader who wears the “C” for Cornell. D’Agostino is an intimidating and dominating defenseman. So, it may seem at first glance to be odd to highlight his offensive contributions to the program when discussing his countless successes. Teams who opposed D’Agostino in the 2009-10 made his presence felt and developed a reputation as one of the most successful defenseman in the ECAC. A descriptor whose scope D’Agostino has made relevant to a national stage in his sophomore and junior seasons. Clogging passing lanes and blocking shots became a thing for which the Lynah Faithful could depend upon D’Agostino at the end of his freshman campaign. He became as reliable and effective of a defenseman as then-senior blueliners Joe Scali and Justin Krueger, the eventual winner of the ECAC’s Hockey Defenseman of the Year Award in 2010. Rivaling Scali in shots blocked and Krueger in terms of effectiveness was impressive for a freshman defenseman. D’Agostino has gotten only better since then. Then-junior alternate captain Nick D'Agostino forces a turnover and goes on the attack creating offensive opportunities to the raucous applause of the adoring Lynah Faithful. D'Agostino's steadfast and solid defensive play against the Michigan Wolverines helped defend Cornell's 2-1 lead for much of the game in the 2012 NCAA Midwest Regional Semifinal. Offensively, D’Agostino’s skills cannot be underestimated. He is one of the most prolific scorers for Cornell. This began early in his career. D’Agostino led then-freshmen in lifting his team with 18 points during the 2009-10 season. He climbed the relative rankings his sophomore season but ceded his claim to being the member of the Class of 2013 who tickled the twine most to then-sophomore forward Greg Miller. Even behind the blue line in a leadership role with a surging Greg Miller and a freshman class with extreme offensive upside, D’Agostino still registered as the team’s sixth-most offensively productive player. D’Agostino ranks fifth in terms of points produced per game of those players returning from the 2011-12 season. His production of 0.59 points per game is particularly impressive considering the Lynah Faithful can breathe particularly easy when he is on the ice knowing that offensive opportunities for the opposition will be extremely poor and very limited. The greatest trait that D’Agostino has developed over his three seasons on East Hill is the trait that makes him best suited to serve as captain as Cornell seeks to reach new heights on the college hockey landscape. D’Agostino becomes whatever Cornell needs him to be in a given situation. Few players have shown such versatility and even fewer are able to do it so seemingly effortlessly as Nick D’Agostino. The team awarded D’Agostino the privilege and responsibility of wearing an “A” as an alternate captain his junior season. He rose to the challenge of wearing the mantle of formal leadership. A skilled but still young freshman class joined the ranks of the Big Red in Fall 2011. D’Agostino took charge of leading the program including these freshmen during the early games of the 2011-12 season. Not unexpectedly, D’Agostino occupied central roles on the power-play and penalty-kill units for the Big Red. It was the poise that he demonstrated that began the tidal wave of success that propelled Cornell to the 2012 NCAA Midwest Regional Final. The alternate captain quarterbacked the power-play unit with great skill. His ultimate tally of eight goals from last campaign included six that were earned on the power play. This was but one of many ways that the Ontario-native blueliner showed his leadership in becoming what and who Cornell needed him to be. The most recognizable example of this trait is his ability to seize a given opportunity, convert upon it, and then transition effortlessly in employing his considerable defensive skills over several long shifts to protect a lead. The striking statistical manifestation of this is found in D’Agostino’s number of game-winning goals. D’Agostino’s impressive total of five game-winning goals from last season placed him sixth nationally in that category. He was not only pivotal in gaining such leads but in defending those leads once earned in most of the contests in which he tallied for that statistic. He will be even more crucial to the success that he has envisioned for Cornell during his last campaign in carnelian and white. D’Agostino is the epitomic leader of Cornell hockey in the modern era. He is a grinding defenseman who limits scoring opportunities while demonstrating impressive speed and offensive upside. However, leading and standing up for one’s team does not always occur in the context of in-game activity, especially when playing for a program that defines itself historically by its grit and physicality. The January 2011 edition of the Cornell-Harvard rivalry at Bright Hockey Center allowed D’Agostino to demonstrate his willingness to fill even the least favored of leadership roles if needed. The 2010-11 season saw Cornell heavily in a rebuilding year after the departure of a very talented senior class. Cornell had swept Harvard with four victories during the 2009-10 season. Needless to say, our rivals in Crimson were upset when a stellar Andy Iles delivered a stunning performance to defend a 2-1 lead through three periods of play. The cantankerous Cantabs were very displeased with the result. Unable to contain their displeasure, they took it out on the Cornell players on the ice after the last whistle. Cheap shots and punches were thrown from Harvard at Cornell. The Harvard announcers on the broadcast can be heard noting that Harvard started the altercation. D’Agostino, unable to abate his overwhelming desire to defend his teammates from such unsportsmanlike violence, leapt from Cornell’s bench onto the ice to assist his teammates in whatever manner that he could. Even though the Lynah Faithful and WAFT do not condone such behavior or laud it, one must respect D’Agostino’s willingness to sacrifice for his team and defend it against such deplorable behavior. D’Agostino per NCAA rules was awarded a one-game suspension for leaving the bench during an on-ice altercation. His alacrity in sacrificing everything against the Harvard Crimson received particular recognition at the end of last season. D’Agostino was awarded the Crimson Cup. The Cup is presented to the player who stood out most during Cornell’s games against its most hated foe in a given season. D’Agostino contributed two goals against the Crimson in Cornell’s November 2011 meeting against them and then an assist in the last regular-season meeting of the two archrivals. His two goals against the Crimson at Bright last season can be seen in the above video. These impressive contributions earned D’Agostino this award unquestionably, but his career performance against the Crimson may deserve him yet another title. D’Agostino is this generation’s “Crimson Killer.” His performance against the Cantabs is noteworthy for even a player as skilled as he. In three years, D’Agostino has tallied nine points against the Crimson. This total includes five goals. Two of those five goals were the game-winning goal in the contest. He opened the scoring against Harvard in the 2010 ECAC Quarterfinal series against Harvard at Lynah Rink with an assist to Colin Greening. An assist was not enough for this era’s “Crimson Killer” as he felt compelled to tally two goals within twenty minutes before the time expired. This offensive outburst propelled Cornell to claim the only 4-0 season sweep in the history of the 102 year-old Cornell-Harvard rivalry. Cornell has gone 6-2-1 against the Crimson since D’Agostino donned a carnelian and white sweater. His ability to elevate his game in what is typically the regular season’s most emotionally charged game augments his ability to become or do whatever Cornell needs. If anyone has any other suggestions as to who is the best defenseman in the ECAC, D'Agostino forcefully disagrees. He has proven consistently that he is the best defenseman for contributions at both ends of the ice. D'Agostino wearing proudly his captain's "C" as he will during his tenure of the 2012-13 season. This image will become a fearsome sight for those who attempt to tread into Cornell's zone or who underestimate D'Agostino's offensive skills. It would be amiss to conclude this post without mentioning that the Pittsburgh Penguins selected Nick D’Agostino in the 2008 NHL Draft before he arrived at Cornell. The Lynah Faithful and WAFT will follow and support him as he plays for the Penguins. He will be a great addition to their franchise when he departs East Hill. However, it is difficult to discuss the departure of such an integral and great player for Cornell on the cusp of what the team and he thinks will be a historic season for Cornell hockey. Nick D’Agostino is foremost a leader for Cornell. That is clear from offensive and defensive statistics as well as conduct on the ice. He will ask of no one any more than he is willing to do himself. His long shifts that he began as a freshman? They have gone nowhere. If anything, they have lengthened as his resolve to help his team in any way possible as increased. D’Agostino is the best defenseman in the ECAC. He is one of the best defensemen in the nation. He will have the opportunity to claim the latter title outright this season. While other defensemen in the ECAC may gain more preseason acclaim, if one delves deeper into their statistics and contributions, it is discernible that they sacrifice defensive accountability and contributions for the glory of goal scoring. D’Agostino, unlike them, is not just a forward behind the blue line. He is a reliable and skilled defenseman who does what his team needs to win and never sacrifices the benefit of the team for personal goal-scoring glory. He is the best defenseman in the nation at both ends of the ice. There is no better player to lead Cornell into a rigorous 2012-13 schedule than Nick D’Agostino. He has shown leadership qualities since he first stepped on the ice at Lynah Rink. His season is off to a great start already as he has totaled two assists in just 60 minutes of an exhibition game in the tilt against the United States Under-18 Development Program. His offensive and defense skill sets as well as his undeniable and integral leadership will help propel Cornell to the pinnacle of the college hockey world yet again. D’Agostino’s willingness to do what is necessary to assist his team and to become what his team needs in a moment’s notice should allow the Lynah Faithful to rest assured that success will come this season. The cap’n will make it happ’n. D'Agostino can be seen showing his unadulterated happiness at Cornell claiming its twelfth ECAC Championship during his freshman season. His play against Harvard in the ECAC Quarterfinals propelled them to victory in that series and the league's tournament. This will not be the last tournament title that D'Agostino helps Cornell claim. We think that he wants two more tournament trophies.